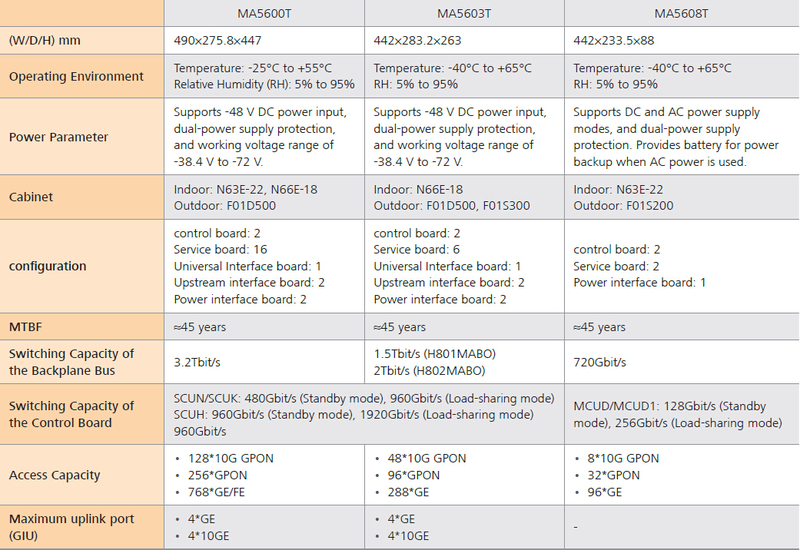 Huawei GPON OLT MA5608T has has 2 slots for control boards, 2 slots for service boards, 1 slots for power interface boards. MA5608T is a small-capacity device. Download Huawei GPON OLT MA5608T Specification Doc. board configures, manages, and controls the device, and also implements the simple route protocol functions. H805GPBD is a 8-port GPON OLT Interface Board. It works with the optical network terminal (ONT) to provide GPON access service. Automatic power shutdown in case of a high temperature. The H801MPWC board is a power board with dual DC power inputs. The H801MPWC board leads in the -48 V DC power to the device. SmartAX MA5608T is the global first all-in-one access platform which can provide DSL and optical integrated access. It can provide high density ADSL2+, VDSL2, POTS, ISDN, PON and Ethernet fiber P2P access, triple-play service, and TDM/ATM/Ethernet leased line services for business customers. The MA5608T can also offer mobile backhaul with high reliability and high precision clock, and high density 2*GE/10GE interfaces for cascading remote access equipment’s. MA5608T helps to simplify network architecture, to enable seamless migration in FTTx network and lower TCO essentially. Support multiple scenarios: FTTC / FTTB / FTTH / FTTO / FTTM. Traditional E1 service access, NATIVE TDM or CESoP for traditional E1 service of enterprise and mobile backhaul. Supports a split ratio of 1:128. Support small form-factor pluggable (SFP) optical module of Class B+ or Class C+ and XFP optical module, which can be used in different scenarios. High-density 48 single-fiber bi-directional or 24 two-fiber bi-directional GE/FE P2P optical access is supported. Supports the high-performance and large-capacity control board SCUH. In active/standby mode, SCUH supports 20 Gbit/s switching bandwidth for each slot. In load sharing mode, SCUH supports 40 Gbit/s switching bandwidth for each slot. And provides 960G switching capacity (doubles performance capacity), improving access user bandwidth. The MA5600T/MA5603T/MA5608T supports multiple xDSL access and POTS access modes and makes full use of existing copper cable resources to provide users with rich and flexible network services. The retransmission and INM functions solve the line quality deterioration problem caused by line bit errors and line noise, which ensures the line access quality. The xDSL ports works with the ADSL terminal unit-remote end (ATU-R) or the VDSL terminal unit-remote end (VTU-R), which can provides the highest-density 64 channels of xDSL access and 48 channels of POTS access. Far-end crosstalk (FEXT) is one of key factors affecting the performance and stability of the VDSL2 system. The MA5603T supports the vectoring feature. Vectoring uses vectors to solve FEXT of VDSL2 lines so as to improve bandwidth and performance of multi-pair VDSL2 lines. It effectively decreases crosstalk for short-distance lines (shorter than 1 km). The rate of a single VDSL line can be increased about 50%-90% within 800 m. Provides higher bandwidth and more types of services over existing VDSL2 lines after the rate for a single VDSL2 user is increased. Supports the High-Performance Multicast Service. The device employs the multicast technology to provide IP video services, including live TV and QVoD, for carriers. By introducing the multicast technology, the network device can manage, control, and forward IP video services and thus meets carriers’ requirements for provisioning IP video service. TheMA5600T/MA5603T/MA5608Thas completed its interoperability test with all mainstream NGN/IMSs. Connection to the NGN/IMS network through SIP or H.248, implementing the VoIP service (including the voice, fax, and modem services). The MA5600T/MA5603T/MA5608T supports reconstruction of traditional voice devices such as the N*64K private line device and ISDN PRI PBX, implementing the ALL IP architecture. Implements base station access solution by using MA5600T/MA5603T/MA5608T (OLT)+MDU. And the MA5600T/MA5603T/MA5608T supports clock synchronization in the base station access scenario. The MPLS PWE3 provides the E2E reliability and quality assurance for the service. The MA5600T/MA5603T/MA5608T features powerful access and convergence capability. In the downstream direction, it supports cascading to other devices through the GE or 10GE port. In the upstream direction, it supports connection to the IP/MPLS network through the GE or 10GE port. It also supports dual homing to the BRAS through direct connection. The MA5600T/MA5603T supports the centric management for GE remote extended subracks in FTTB or FTTC scenarios so that the network features higher scalability. The GE remote extended subrack feature uses new technologies such as VDSL2 and vectoring on the copper line network to deploy ultra-broadband networks more conveniently and rapidly. As large-scale fiber to the curb (FTTC) construction becomes popular, the number of outdoor sites grows rapidly. The remote integrated sites are provisioned with cabinets, power systems, temperature control units, and batteries. However, some maintenance works cannot be done remotely by the remote maintenance technology. Maintenance personnel need to be assigned to the sites, which results in low maintenance efficiency and high costs. This feature is introduced to solve this issue. When the MA5600T/MA5603T is configured with the enhanced service management unit (SMU) power system, the following feature items are supported: Intelligent property management for the key components (including the cabinet, power system, temperature control unit, and battery) on the site and Intelligent floating charging management for batteries on the site. Supports the MSTP protocol, featuring the loop protection function. Supports the RRPP protocol, implementing rapid switching in a ring network. Supports the LACP and inter-board aggregation features, increasing the bandwidth and providing the protection function. Supports bidirectional forwarding detection (BFD), improving the reliability of IP applications (such as real-time voice service) and providing support to the network stability for service providers. Supports the smart link application, which implements the redundancy backup and quick migration of active and standby links, ensuring the high reliability and high-speed convergence. Supports Type B redundancy protection for the GPON, ensuring that the services are not interrupted when the backbone optical fiber is faulty. Supports GPON Type C redundancy protection, improving the device reliability. The superior QoS can guarantee an expected service level with respect to bandwidth, latency, jitter, and packet loss in a communication network. Supports three queue scheduling modes: priority queue (PQ), weighted round robin (WRR), and PQ+WRR. Supports hierarchical quality of service (HQoS), which guarantees the multi-service bandwidths for multiple users: The first level guarantees the user bandwidths, and the second level guarantees the bandwidths for the services of each user. This ensures that the guaranteed bandwidths absolutely pass and the burst bandwidths pass fairly. IPv6 radically solves the problem of IP address shortage. Moreover, IPv6 has the following advantages: It is easy to deploy, compatible with various applications, easy for IPv4 networks to transit to IPv6 networks. Supports the IPv6 address management and assignment. Supports the IPv6 stack and IPv6 host function. Supports the IPv6 QoS and security, guarantee the security of the IPv6 network. Supports the IPv6 layer 2 transparent transmission. Supports the IPv6 multicast. By using IPv6 multicast technologies, the network device can manage, control, and forward IPv6 video services and in this way meets carriers’ requirements for provisioning IPv6 video services. The MA5600T/MA5603T/MA5608T meets the efficiency requirements of the European Commission CoC (Code of Conduct). The energy-efficient design ensures quiet operation and optimal heat dissipation, reduces the impact on the environment, and lowers operational costs. Uses chipsets with the highest density and integration in the industry. Uses high-density hardware to improve port energy efficiency. Supports independent shutdown for service ports. Supports refined board power saving. Supports stepless speed adjustment for fans based on component temperature. Supports fan speed control through host software. Supports L2 low-power consumption and L3 standby status for digital subscriber line (DSL) service ports. Automatically shuts down vectoring components when the vectoring function is disabled. Automatically starts the vectoring components when the vectoring function is enabled. These functions dynamically reduce power consumption. The MA5600T/MA5603T/MA5608T supports the fiber to the home (FTTH) network application. It can be connected to the ONT in the user’s house through the PON port or provide the P2P optical access service through the FE or GE port. The MA5600T/MA5603T/MA5608T supports the fiber to the building (FTTB) network application, and is connected to the ONU (MDU or ONT) that is deployed in the corridor through the PON port. The MA5600T/MA5603T/MA5608T supports the fiber to the curb (FTTC) network application, connected to the ONU that is deployed at the curb through the PON port, or connected to the DSLAM that is deployed at the curb through the GE optical port. The MA5600T/MA5603T/MA5608T supports multiple copper access modes such as ADSL2+, VDSL2, and SHDSL. The MA5600T/MA5603T/MA5608T supports the voice service network application. The MA5600T/MA5603T/MA5608T can function as an AG (Access Gateway) in the softswitch network to provide the voice service and transmit the voice service to the IMS network. In addition, the MA5600T/MA5603T/MA5608T supports the TDM SHDSL access, which is applicable to reconstruction of the traditional voice network.